There’s no interruption to your TV signal—any channel and provider works! All you need is a HD flat panel TV that’s at least 32 inches with Internet connectivity of 1.5MB or more per screen. From there, we’ll help you get the messages of your choosing in front of everyone who’s sitting in your waiting room, office or lobby watching your TV. We’ll give you a pre-programmed device that fits behind your TV and connects directly to your waiting area’s television set. After the hardware’s attached to your TV, you connect it to your wireless network and begin streaming to your TV. 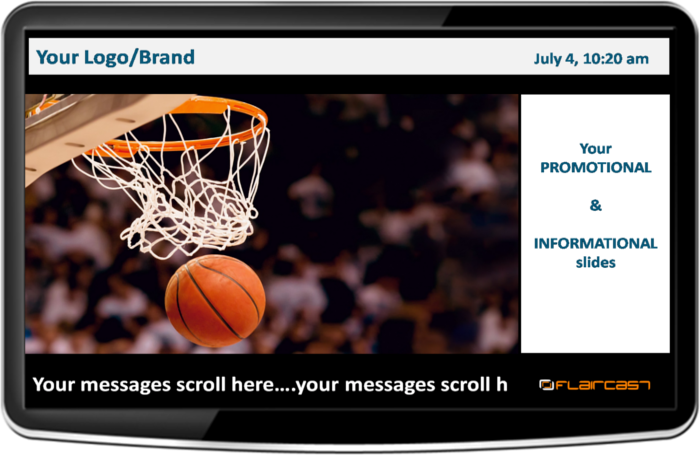 Take control of your in-house messaging with Flaircast today!